January 29, 2019 January 29, 2019 - by benign0 - 3 Comments. The successful clean-up of Manila Bay has certainly created a lot of buzz online and, very likely, a publicity bonanza over traditional media channels. There is the question, of course, of on-going maintenance — the spotty record of which is something Filipinos are renowned for. Nonetheless, an abundance of photos, memes, and testimonials are making the rounds on the Net and the results will likely be felt in the remaining months leading to this year’s congressional elections. Normally, the Opposition led by the Liberal Party (a.k.a. the Yellowtards) will have lots of negativity to serve as fodder for their sneers at what they will regard as a mere stunt to “distract” from, guess what, the “tyranny” of the administration of Philippine President Rodrigo Duterte. This time, however, the Opposition seems to have yet again been stunned into a deafening silence — a silence that sounds like the one beheld following the opening of Boracay Island after a similar “clean-up”. Who, after all, would dare criticise an initiative that had created the sort of buzz delivered by this and the previous Boracay project? That’d be political suicide — specially in the midst of a campaign on a critical election year. Say what one will, but both the Boracay and Manila Bay clean-up projects made Duterte look good. Oh yeah, and those beaches too (yes, Manila Bay has a beach)! There is, of course, lots to quibble over — that these may all be publicity stunts to distract the population from the usual stuff Opposition “influencers” shriek about, that this does nothing to “address” the “plight” of the “poor”, that Big Bad Corporations continue to maintain contract workers. Blah blah blah. But, see, politicians are only as good as the seats in government that they win. You may, for example, be the “good” former Solicitor General who grew up in ihc-ihc kadiri-to-death Tondo. But if you are unable to win an election your “goodness” is worth jack squat. Filipinos signed up to this system — the popularity contest that is Pinoy-style democracy executed pursuant to the 1987 Yellowtard Constitution. Filipino leaders and representatives are not Academy Award winners chosen by an esteemed team of scholars. Nor are they Golden Globe Awardees chosen by a body of those media types. Filipino execs and reps are People’s Choice Awardees — selected for their chops at attracting the popular sentiment and the raw numbers at the polls. It is all a win-win. Boracay and Manila Bay are visible national artifacts that one — regardless of political affiliation — cannot help but marvel at now that their respective beauties shine through. These and other ways the incumbent administration has captured the hearts of the broader Filipino public exhibit virtuouso winning strategies at play. On the other side of this spectrum of competence — the losing side — is one that makes use of exclusive rhetoric as only the Yellowtards can deliver. The Yellowtards have doomed the Opposition thanks to their obsolete “good” versus “evil” polarisation of their audience, the blatantly intelligence-insulting inconsistency and hypocrisy in their messaging, their foolish latching onto a relic of medieval aristocracy that the Roman Catholic Church had become, and the uppity way that they mouth notions like “human rights” and “equality” that are hopelessly abstract to the average Filipino voter. It turns out, the astounding loss of an entire nation on the back of Yellowtard rhetoric in 2016 was just Phase 1 of what is looking like a three-phase phase out — no, eradication — of the Yellowtard narrative. Phase 2 will be the crushing of all remaining semblance of Yellowtard presence in the Senate. Phase 3, if the political trajectory is maintained, will be the long-overdue junking of the 1987 Yellowtard Constitution and the dawn of a new epoch in Philippine politics. 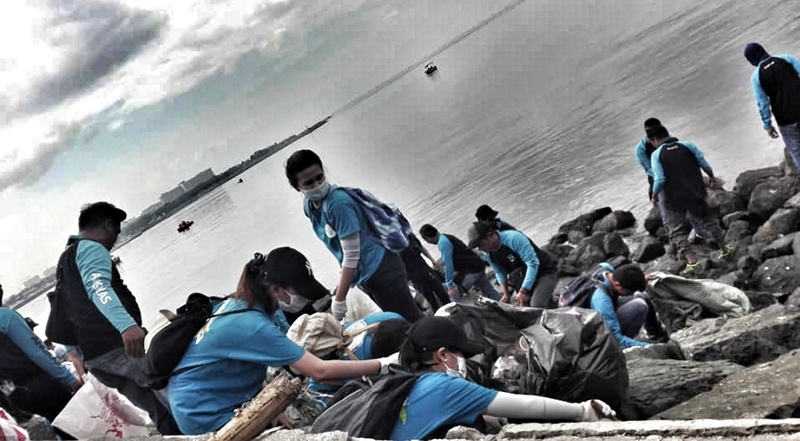 All this could be gleaned from the genius behind the Boracay and Manila Bay clean-up initiatives as well as the sniper-like consistency with which the Duterte government has so far remained on-point with its campaign promises. Indeed, these were no secret weapons nor strategies that require rocket scientists to implement. The lessons were all for the taking. The only thing that prevented the Yellowtards from picking up and running with these abundant lessons is their fatal arrogance, their regimented inbred thinking, and their shallow bench of sophomoric bloggers, attack “journalists”, and wet-behind-the-ears “thought leaders”. Filipinos can accomplish something with the proper leadership, and will. The cleanup of Boracay and Manila Bay have shown already. Unfortunately, the politically bankrupt YellowTard opposition, talks only about , “human rights” and about anything against the present administration. Who would believe them ? They have more than 30 years in power. All they did was steal from the National Treasury; make themselves extremely wealthy; and squandered the resources of our country. While, they made us OFW / slaves. We have a lot to clean up in our mindset/culture , and in our government. Most of all, we have to clean up COMELEC and the HOCUS PCOS / SMART SWITIK . We can be a great and a prosperous nation, if we want to, and have the will to be one !